Hi guy... I'm using Maxthon 4.9.3.1000. This is a strange problem: I'm able to get an access in all websites that I've memorized in Magic Fill, but I cant see them anymore. If I click on the yellow key icon, I see the entire list of addresses saved, and they work all. If I go to Magic Fill option, the window is totally blank. May you help me, please? Update to the latest version and see if that fixes the problem. Installed, but this the same issue. I can see all my saved list, but I can't manage (edit / select / delete) that. The result is that I have a long list of ID's (picture #2), but I can't see passwords anymore. And this is true also for new passwords...I just tried to memorize new data: I can use it, but as you can see on the picture #1 everything is still empty. Does anything happen when you try and use the search box to find an entry? And what about the other sections "Exceptions" and "General identities". What happens if you enter something into those? The search box can't find anything, but everything works good with log-ins on all websites. Do you use a passport account? If yes, logout and see what happens if you save a password using the guest account. Could you please try syncing your passwords again? The cloud server colleague made some resetting on your account. Do you mean even after our resetting from server, the previous stored passwords didn't come back but those newly saved were no problem. Is that? I don't know exactly the mechanism. I had not used sync function until you requested me to do it. So, after I did that, I found on my account what you see in the last screen. I checked if it was possible to add new data with guest mode, and the test was positive. The thing that I don't get, is why I can't see and edit anything. Do you think I should install Maxthon 5? Are there any specific folders that I have to save before to uninstall my version? It will be better if this problem could be fixed under MX4, and then you upgrade it to MX5, because MX5 is a totally brand new version with MX4. Given that MagicFill functions well when you login in those websites, it means your password data was well saved on cloud sever, but you can't see them in local device, so I think some related local file may be deleted by mistake. My suggestion is that you uninstall this version, and checked "remove all local data" option during the uninstall procedure, (to make sure all local data could be generated again when you re-install it) Then download same version and re-install it. After re-installing finishes, sync all your information, and then check on settings whether it's ok.
Be sure you have synced all your data to Cloud before you do uninstall !!! It's very important and will decide whether you will have your data in new browser. So I suggest you can click "Synchronize All" as above .gif demo shows. I think the situation is exacly the opposite of your description: I'm sure everything is good LOCALLY, but for some reason I can't synchronize. Infact I can log-in everywhere, ONLY if I stay logged-out from my Maxthon account. When I surf using the Maxthon Passport, and I push "Alt+Q" to have an automatic access on other websites, nothing appears...no ID, no passwords. So I'm very scared to use "remove all local data" option during the uninstall procedure. I risk to lose all my data. Any last suggestions to try before I trash my computer? Let's try something. (and apologies for going through this earlier). Extract this to your desktop and run Maxthon.exe in the Bin folder. (Make sure your installed version of Maxthon is NOT running when testing!). Test saving a few forms in guest mode (not signed in) and make sure it works properly. Then sign-in to your passport account, wait for everything to sync and see if your saved passwords show. If still nothing shows, then it's something saved to the cloud that is causing the issue. If it's working, then it's a local issue with something on your install. If it does work properly, you can exit Maxthon portable, start your installed version and hopefully on sync it may fix whatever the issue was. If not, then we might look into some copy/pasting... but we'll deal with that later if required. I don't think the problem is your cloud. I had nothing saved on that, before this issue. When BugMiss006 suggested me to try it, I did, and realized that I'm able to sync ONLY NEW DATA (created after my post). but I can see them all, on the principal list (when I click the "yellow key button"). Now, I'll try to install the portable version. PS: obviusly, I can add new data to my old list, but I can't delete anything because not editable, so my Magic Fill list became big and bigger. PS2: question: could it be caused by some disk cleaner? I had nothing saved on that, before this issue. Ok then. I thought you were using a passport account. If you're just using a guest account, then it makes things slightly easier. 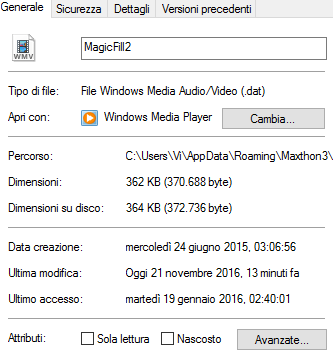 Copy the MagicFill2.dat file from the \Users\[USERNAME]\AppData\Roaming\Maxthon3\Users\guest\MagicFill to the portable version \UserData\Users\guest\MagicFill folder from your install version to the portable version folder. To my knowledge that is the only file that contains the data, so if it's still able to enter that data on pages that means the data is still there and accessible. Hopefully by copying it to the portable version it will display it all properly, then we can look further for the no displaying problem if required. Anything is possible. But if there is a problem with the data file then i'd say the data would be corrupt, not invisible. The fact that it's not showing I think is more that the code that displays the data is the problem, rather than the actual saved passwords file. Hopefully transferring it to the portable version we can figure out if that is the case. my edit page is still EMPTY. Can you use mx5(portable version) and import your mx4 magic fill data ? mx5 could have fixed a lot of bugs in mx4. I mean, the Maxthon 5 detected the 4 and asked me if I wanted to import. I did it with guest mode, so now I have a long list of all my accounts, and there's not a real page to edit. I can edit and delete immediately, so I deleted a pair of "random" data that I invented when I was desperate. Tomorrow I'll try better and let you know. Now I'd like to discover the orgin of my issue. The only thing that I can see is that my MagicFill2.dat is updated everytime I use Maxthon (normal and portable)...or at least changes the date of modify (the access is always at Jan 2016)...I'll show you a screenshot. Maxthon 5 works fine and it's very fast. I'll use it, uninstalling the 4. Should I do anything before this process, to not risk to erase something important? What if I use this portable version on my laptop? Is there a real difference with the standard version, or it's just the fact that I can use it with my USB memory stick? No difference. Just that all the data stays in the same folder. Installer version saves stuff in registry and in the users\appdata folder. This way if you need to backup anything, or transfer any data you can just copy the entire Maxthon folder. Glad you got things figured out...even though we didn't get to the cause of the issue. Yes. I tried many experiments, but still: the file MagicFill2.dat (with the version 4) becomes big and bigger, when I add data, and I can't delete or edit. Plus, I can't sync it. By the way...I'm not able to find the version 5's backup. Is it still in this main folder? I would like to move it away from desktop.